Rajasthan Cooperative Bank Recruitment 2018 RSCB Assistant Manager GSS KVSS 906 Vacancy Latest News Rajasthan State Cooperative Bank Recruitment 2018. Punjab Gramin Bank Recruitment 2018 Vacancy in Sahkari Bank PO Clerk & Assistant Manager Jobs notification Punjab Gramin Bank PGBHO Recruitment 2018. UP Agriculture Technical Assistant Syllabus 2018 pdf Download the UP Krishi Vibhag Syllabus of Agriculture Technical Assistant Exam Papers. Exam Pattern of Agriculture Assistant is also mention below. Rajasthan Patwari Admit Card 2018 Village Accountant of RSMSSB patwari admit card 2018 News is coming that Raj Patwari Mains exam date was scheduled to be held on October November 2018. RSMSSB latest jobs for Patwari exam answer key is examination date out now on official bor.rajasthan.gov.in website. 124 Bill Collector Jobs 2018: The Job of Bill Collector is opened by Civil Service Department in Department of Revenue, Treasury and Account. TSPSC revealed the good news of Bill Collector through Preliminary Test, Later on they will called to next exam who selected in TSPSC Bill Collected Recruitment 2018. SBI Scholarship Loan Scheme: - State Bank of India offering Scholarship Loan scheme for that candidates who are meritorious in class of 12th, Graduate course from any General, Technical and Management Degree. SBI Educational Loan is granted to extend financial assistance to deserving/meritorious students for pursuing higher education in India and abroad. Bihar Amin Kanungo Syllabus 2018:- Staff Selection Commission Model Papers 12,000 Vacancies of Revenue Inspector in Revenue & Land Reform Department may be prepare from below pattern. Rajasthan Patwari Bharti Result 2018 You can check in this section latest raj patwari result 2018 general obc sc st cut off marks. Bihar Revenue Inspector Recruitment 2018:- Bihar Rajaswa Vibhag is going to appoint 12000 Revenue Inspector which is also called AMIN Kanungo in Hindi. This Bihar Amin Kanungo Bharti 2018 officially announces in the month August or may be extended to September. Bihar Revenue Inspector main work is to collect Revenue from Rajaswa Vibhag Village through Land, Plotting, and Feeding of Revenue collection. How to Stop Spam Calls on Mobile: - Telecom Regulatory Authority of India has given decision on 19 July to Stop Spam Calls, Block Unwanted calls on both Mobile and Landline numbers. Trai said Network operator like JIO Airtel IDEA, Vodafone and other companies should first have to take clearance from its costumer as," I agree to receive commercial call and advertisement in mobile number" than after they are allowed to call any people through any call center. Rs 50 Lakh Fine for Operator: - due to not following TRAI rules. Fine and Jurmana has increased to 5 Times Rs 50 Lakh when any costumer files case on leak information. mPassport Seva Mobile is newly made to check Mobile Passport Seva Application of your status.central government has said mobile application passport avedan is as secure as applying offline. 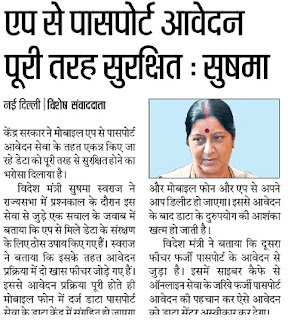 This sentence is given by sushma swaraj who have taken self responsibility of Passport apply through mobile, Smartphone or computer. In this digital India time anybody can fill form of Mpassport application back to your home. Sushma swaraj has said this reply of question in the session of Parliament when somebody has asked whether mPassport application whoever installed in their mobile is safe or not. Amity University Scholarship 2019 Amity University gives Students scholarship on Merit Basis in Entrance Exam, after 12th through Direct Admission 50% Off On 80% percent opted in Physics, Chemistry, Maths and English and 3rd one is Amity University Scholarship based on financial problem. The main focus of Amity University is to focus quality education in professional studies. Amity have vast amount of course must be checked by any students who in 12th and next year they joining amity university and guardian who have dream on their children must be studying in AMITY. Raj Patwari Recruitment 2018:- Board of Revenue, Government of Rajasthan 2739 RSMSSB Patwari Recruitment has recently announced the notification to fill the 4515 vacancies of Patwari.The examination will be held on 2018 to select those candidates for the post who have applied before the last date to apply Rajasthan patwari 2739 recruitment 2018.